Is Apple Pay running late? Apple's press release states that Apple Pay will be available from October, but according to one bank it may creep out in November. The Daily Dot spoke to four US banks about the upcoming Apple Pay system, with USAA saying it will be offering Apple Pay transaction on its Visa and Mastercards from November 7 - although it quickly stated it wasn't committed to that date. 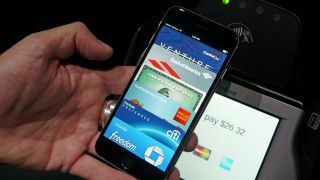 While it may arrive a little later than expected, Apple Pay appears to be the simplest mobile payment technology out there, and we were impressed with its ease of use in our hands on review. You'll need to be in America and own an iPhone 6 or iPhone 6 Plus to use Apple Pay, as these are the only two iPhones with built-in NFC. Owners of the iPhone 5, 5C and 5S will also be able to utilise Apple Pay from next year if they opt to plump for the Apple Watch which also sports the contactless payment feature. We may find our further information on the Cupertino firm's plans for Apple Pay on October 16, as it has an event planned where we could also see the arrival of the iPad Air 2 and iPad Mini 3. The Mobile Payment Jigsaw: Where does Apple Pay stand?